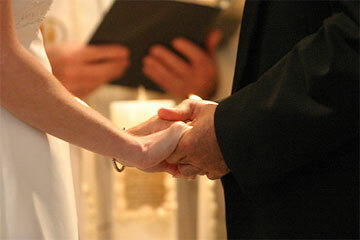 Most couples feel that their wedding vows are the most important part of the service. 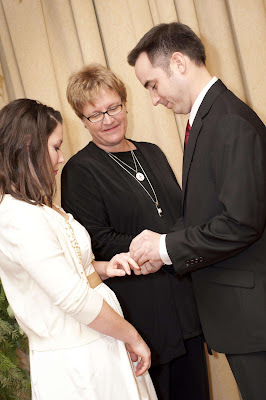 As the Wedding Officiant, I let my couples choose vows from a list I provide, they can mix and match the words, or they can recite their own vows. The list I provide has nine choices. As I looked back at last year's ceremonies, I tallied which ones were the most popular. There is no surprise that the number one choice is the most traditional. I, [ Name ], take you, [ Name ], To be my wedded [wife/husband/partner]. In sickness and in health, To love and to cherish, Till death do us part. [ Name ], I want you to be my [wife/husband/partner], and my one true love. I will trust you and honor you. I will laugh with you and cry with you. Through the best and the worst, Through the difficult and the easy. What may come, I will always be there. As I have given you my hand to hold, So I give you my life to keep. To share and support Your hopes, dreams and goals. When you fall, I will catch you. When you cry, I will comfort you. When you laugh, I will share your joy. Everything I am and everything I have is yours. From this moment forth, I choose to share my life with you.